Green shading denotes wideband couplers. 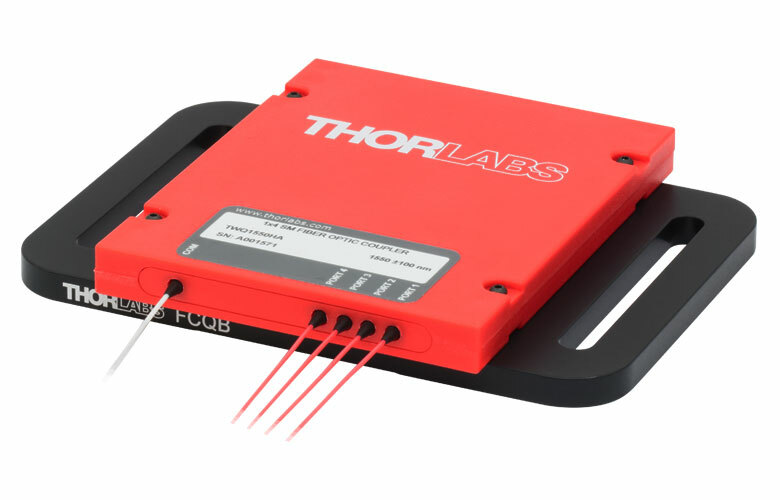 Thorlabs' Single Mode 1x4 Fiber Optic Couplers allow a user to split a single input signal evenly into four output signals. Several center wavelength options are available (see the table to the right for details). 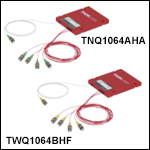 Narrowband couplers have a ±15 nm bandwidth, dual-window couplers have a ±40 nm bandwidth around each center wavelength, and wideband couplers have a ±50 nm or ±100 nm bandwidth. 1x4 couplers are manufactured using three 50:50 fiber couplers to split the signal from the input port (see the 1x4 Coupler Tutorial for details); they cannot be used in reverse to combine light from four sources. The unused ports on these internal 50:50 fiber couplers are terminated in a manner that minimizes back reflections. For our wideband 1x4 couplers, Thorlabs provides an individual test data sheet with each coupler that includes coupling data and performance graphs. These graphs, which show data within the design bandwidth and also show measured data outside of the specified bandwidth including the entire wavelength range where the coupling ratio meets the specified tolerance. Sample data sheets for our 1x4 wideband couplers can be viewed below. 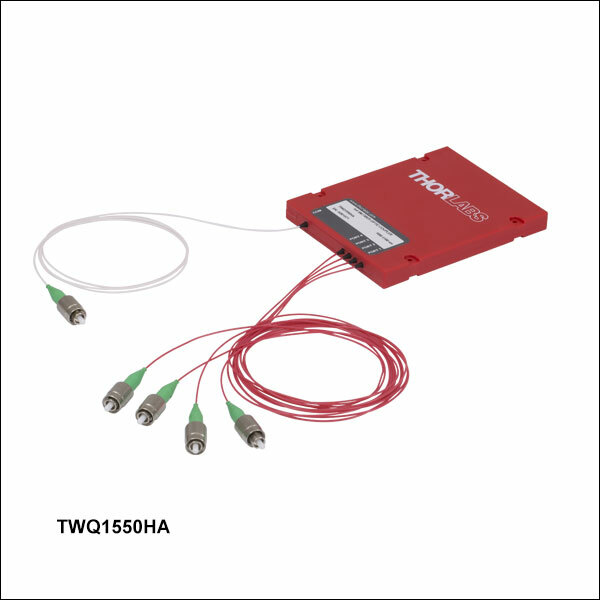 Please note that the data sheets for the 630 nm and 1064 nm 1x4 narrowband couplers do not include performance graphs, but a typical performance plot is included in the spec sheets below. Each single mode coupler is contained in a compact 100 mm x 80 mm x 10 mm housing that includes four through holes for mounting the device to our FCQB mounting base (available separately below). 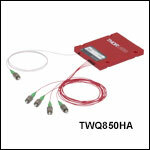 Narrowband and wideband couplers use a labeled red housing and 0.8 m fiber leads jacketed using Ø900 µm Hytrel® tubing. 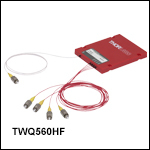 Dual-window couplers feature either a labeled red housing and 0.8 m fiber leads jacketed using Ø900 µm Hytrel® tubing, or a labeled black housing and 0.8 m fiber leads jacketed using Ø3 mm yellow furcation tubing. Couplers are offered from stock with 2.0 mm narrow key FC/PC or FC/APC connectors. Custom coupler configurations with other wavelengths, fiber types, coupling ratios, connectors, or port configurations are also available. Please contact Tech Support with inquiries. This tab provides a brief explanation of how we determine several key specifications for our 1x4 couplers. 1x4 couplers are manufactured using three 50:50 couplers internally to split the input signal evenly among four outputs (as shown in the schematic below). Any unused ports are terminated using a propietary method that reduces back reflections. 1x4 couplers are not recommended for light combining applications and should only be used to split light. 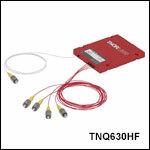 For combining light of different wavelengths, Thorlabs offers a line of wavelength division multiplexers (WDMs). The ports on our 1x4 couplers are configured as shown in the schematic below. Pinput is the input power and Pport1+Pport2+Pport3+Pport4 is the total output power. All powers are expressed in mW. where Pt1, Pt2, and Pt3 are the optical powers (in mW) in the internally terminated fiber ends shown in the image above. This is the result of back reflections at each coupler junction and represents a loss in the total light output at the output ports. For a 1x4 coupler with an even split, the directivity is equal to the optical return loss (ORL). Insertion loss inherently includes both coupling (e.g., light transferred to the other output legs) and excess loss (e.g., light lost from the coupler) effects. The maximum allowed insertion loss for each output is specified. Because the insertion loss in each output is correlated to light coupled to the other outputs, no coupler will ever have the maximum insertion loss in all outputs simultaneously. Insertion loss (in dB) is the ratio of the input power to the output power from each leg of the coupler as a function of wavelength. It captures both the coupling ratio and the excess loss. The coupling ratio is calculated from the measured insertion loss. Coupling ratio (in %) is the ratio of the optical power from each output port to the sum of the total power of all output ports as a function of wavelength. It is not impacted by spectral features such as the water absorption region because all output legs are affected equally. 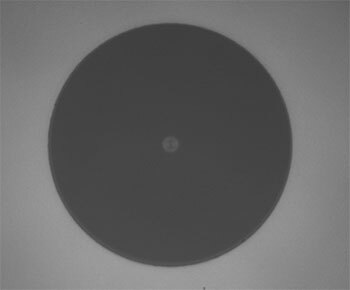 The uniformity is also calculated from the measured insertion loss. Uniformity is the variation (in dB) of the insertion loss over the bandwidth as a function of wavelength. It is a measure of how evenly the insertion loss is distributed over the spectral range. The uniformity is defined as the difference between the insertion loss in one output leg at a given wavelength and the highest or lowest value of insertion loss over the specified wavelength range in that same output leg. Is it possible to have a specification on the length match between the routing ports ? 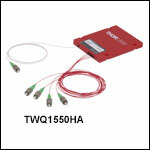 Ideally, we need the 4 outputs to be at the same fibre propagation (+-1mm) from the input port. Thanks. Thank you for contacting Thorlabs. These couplers have a +7.5cm -0.0cm length tolerance on the output connectors. For near identical propagation lengths we can look into providing a custom option. I will reach out to you directly with more information. 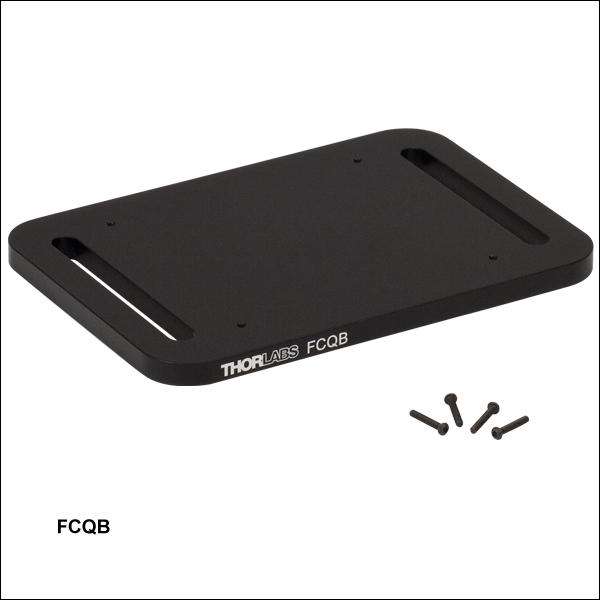 Dear Thorlabs team, I would like to have a 1x4 single mode fiber coupler with different fiber length on each output. Could you make such a custom coupler for us? The application is to generate 4 separate laser pulses delayed about 6.25 ns from each other, from one laser working at 40 MHz repetition rate. Hello, thank you for contacting Thorlabs. While I have some concerns about the energy specifications of your laser, I would typically recommend that optical delays be done either in another fiber connected to the coupler, or in freespace where you can change the optical path length more easily. I would not recommend a custom because the fiber lengths would be critical, and if one leg was damaged, the would device would then be off spec. I will reach out to you with more details. Hello, I'm looking for a 1x16 (or more...preferably 1x24) single mode fiber optic coupler for 532nm. Can Thorlabs make custom couplers or can someone point me towards a company that makes couplers like this? Thank you for your help, Patrick Williams Electrical Test Engineer Applied Physical Electronics, L.C. Hello, thank you for contacting Thorlabs. I will reach out to you directly about our capabilities. Response from Jeremy at Thorlabs: We will get in touch with you to discuss about your application. Hi, I use your RGB1-FC RGB combiner to multiplex three laser outputs into "white" light. I want then to use this white light to simultaneously drive 4 collimators. Given that FCQ632-FC is designed for 632nm and uses an SM600 fiber, I assume I cannot use it for this purpose. Do you offer some similar product I could use? Response from Tim at Thorlabs: Thank you for contacting us! These are bi-directional. However, please note that you will not get the full power from each of the four legs going to the main lead but it will instead be closer to the original coupling ratio for each leg. Also, please note that we don’t test these for bi-directional operation and so the coupling ratio may vary. These 1x4 Wideband Fiber Optic Couplers are designed for splitting a single input signal at 560 nm equally into four output signals. The couplers have an operating bandwidth of ±50 nm and are available with 2.0 mm narrow key FC/PC or FC/APC connectors. They have a max power level of 100 mW with connectors or bare fiber and 250 mW when spliced (see the Damage Threshold tab for more details). Please click on the blue icon for complete specifications. Please see the 1x4 Coupler Tutorial tab for more information on these terms. All values are specified at room temperature over the bandwidth without connectors and measured using the white port as the input. Other fiber types may be available upon request. These 1x4 Narrowband Fiber Optic Couplers are designed to split a single input signal at 630 nm equally into four output signals. The couplers have an operating bandwidth of ±15 nm and are available with 2.0 mm narrow key FC/PC or FC/APC connectors. They can handle a max power of 300 mW with connectors or unterminated (bare) fiber and 0.5 W when spliced (see the Damage Threshold tab for more details). These 1x4 Wideband Fiber Optic Couplers are designed for splitting a single input signal at 850 nm equally into four output signals. The couplers have an operating bandwidth of ±100 nm and are available with 2.0 mm narrow key FC/PC or FC/APC connectors. They can handle a max power of 500 mW with connectors or unterminated (bare) fiber and 2 W when spliced (see the Damage Threshold tab for more details). 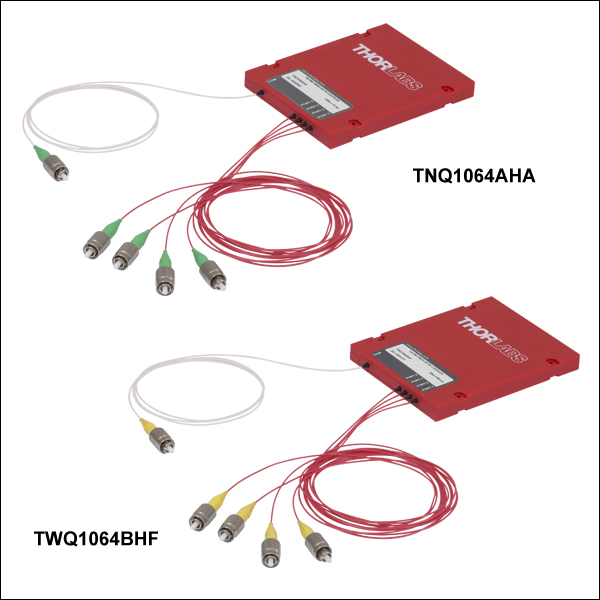 These 1x4 Fiber Optic Couplers are designed for splitting a single input signal at 1064 nm equally into four output signals. 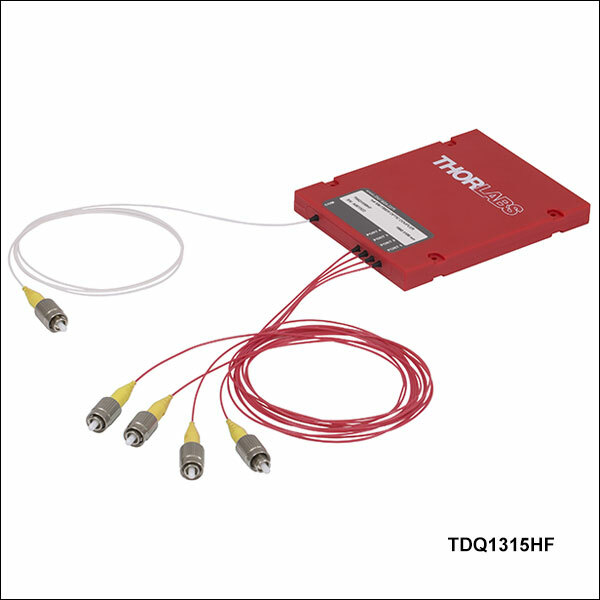 The couplers feature an operating bandwidth of ±15 nm or ±100 nm and are available with 2.0 mm narrow key FC/PC or FC/APC connectors. 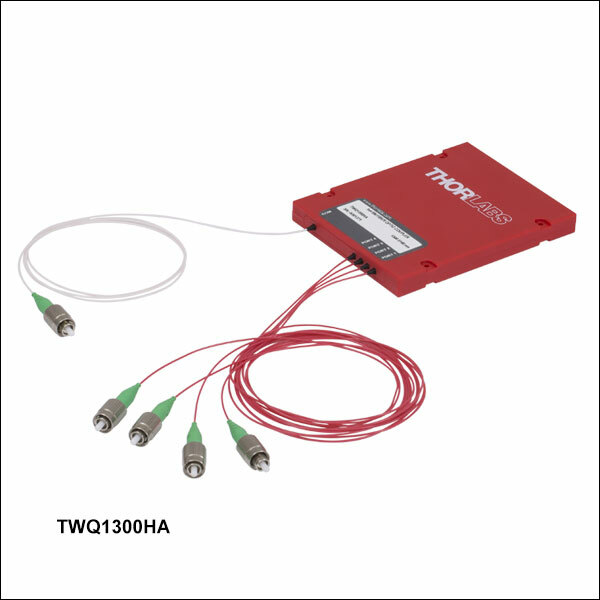 These narrowband and wideband couplers can handle a max power of 1 W with connectors or bare fiber and 5 W when spliced (see the Damage Threshold tab for more details). These 1x4 Wideband Fiber Optic Couplers are designed for splitting a single input signal at 1300 nm equally into four output signals. The couplers have an operating bandwidth of ±100 nm and are available with 2.0 mm narrow key FC/PC or FC/APC connectors. They can handle a max power of 1 W with connectors or bare fiber and 5 W when spliced (see the Damage Threshold tab for more details). Corning SMF-28 fiber type will be specified on the documentation that ships with the coupler. Other fiber types may be available upon request. Please contact Tech Support with inquiries. These 1x4 Dual-Window Fiber Optic Couplers are designed for splitting a single input signal at 1310 nm or 1550 nm equally into four output signals. The couplers have operating bandwidths of ±40 nm and are available with 2.0 mm narrow key FC/PC or FC/APC connectors. They can handle a max power of 1 W with connectors or bare fiber and 5 W when spliced (see the Damage Threshold tab for more details). Corning SMF-28 fiber type will be specified on the documentation that ships with the coupler. These values are specified with connectors at room temperature, over the bandwidth of each center wavelength, and using the white port as the input. These 1x4 Wideband Fiber Optic Couplers are designed for splitting a single input signal at 1550 nm equally into four output signals. The couplers have an operating bandwidth of ±100 nm and are available with 2.0 mm narrow key FC/PC or FC/APC connectors. They can handle a max power of 1 W with connectors or bare fiber and 5 W when spliced (see the Damage Threshold tab for more details). 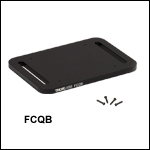 Our FCQB mounting base provides two 2.25" long clearance slots for 1/4" (M6) cap screwsto secure the base to an optical table or other tapped surface. The two clearance slots are located 4" (101.6 mm) apart at opposite edges of the mounting base. Four M2 taps between the clearance slots are positioned to align with the through holes in Thorlabs' RGB wavelength combiners, 1x4 SM Couplers, or 1x4 PM Couplers. Four M2 screws are included.